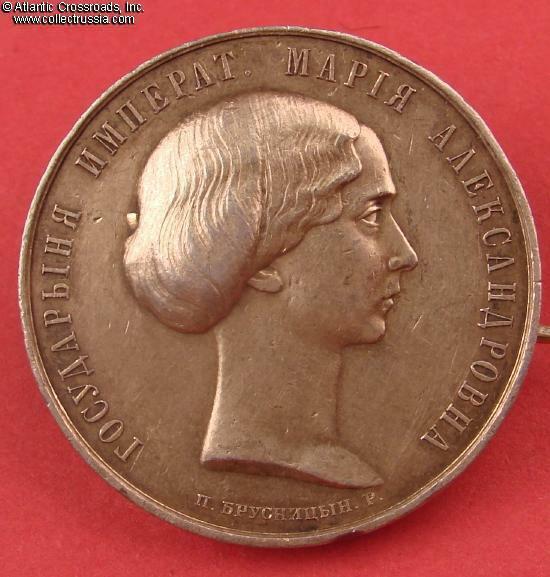 Empress Maria Alexandrovna Merit Medal in Silver for Outstanding Achievements to a Graduate of a High School for Girls ("Zhenskaya Gimnasia"), 1870-1880. In silver, 37.8 mm; weighs 38.5 grams including the pint attachment. Features bas-relief portrait of Empress Maria Alexandrovna (wife of Alexander II). 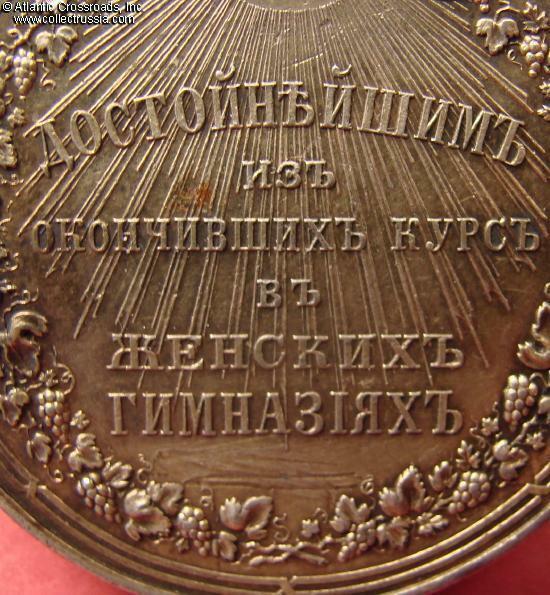 Under the portrait is the name of the engraver "P. Brusnitsyn" (there is another, somewhat less rare version of this medal with Brusnitsin's initials to the undercut of the shoulder). 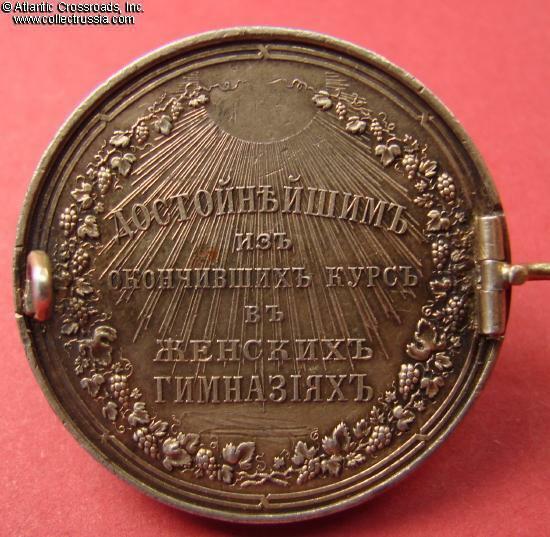 The reverse has inscription "To the Most Deserving Graduates of Women's Gimnasias [High Schools]" (Достойнѣйшимъ Изъ Окончившихъ Курсъ в Женскихъ Гимназияхъ). This is the first version of the merit medal for female graduates (the male version had been established much earlier, in 1835, and remained virtually unchanged until the 1917 revolution). 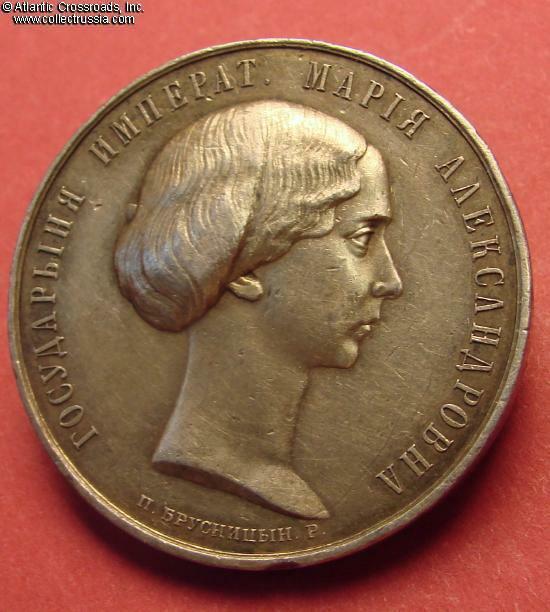 The medal was awarded exclusively by the the Maria Alexandrovna Agency - as opposed to the more numerous public schools managed by the Ministry of Education. After the death of Empress Maria Alexandrovna in 1880, the agency was taken over by Maria Feodorovna, wife of Alexander III. Therefore, from 1881 forward the medals bore the likeness of Maria Fyodorovna (sometimes referred to as "Maria the Angry" by the students). The early, 1870-80 versions with Maria Alexandrovna's portrait are very rare. The medal is in fine to very fine overall condition. 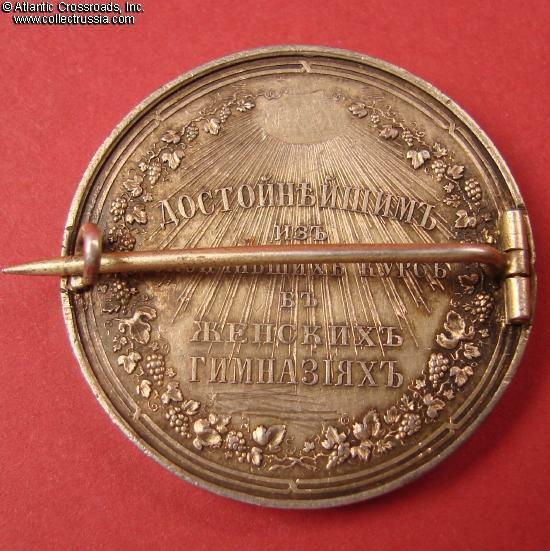 A pin attachment was added to the reverse - probably by the original recipient - to wear the medal as a badge or brooch. There are occasional minor dings to the obverse, but the details of the portrait are nicely preserved. 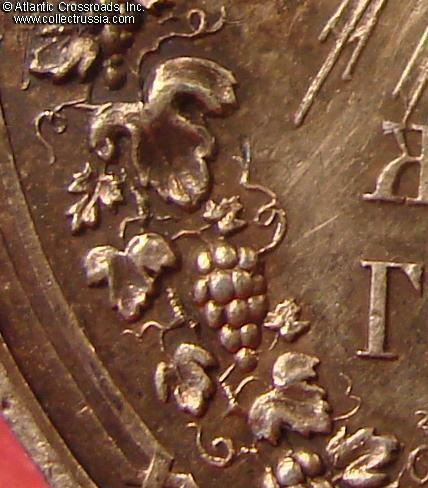 The reverse has some scratches, mostly in the lower portion, but its details are extremely well preserved and crisp. 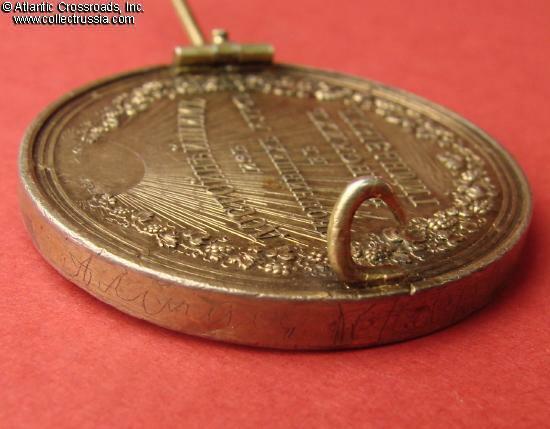 The rim of the medal has small edge knocks and some illegible inscriptions - possibly the name of the original owner.